This post is going to be very straightforward hor. 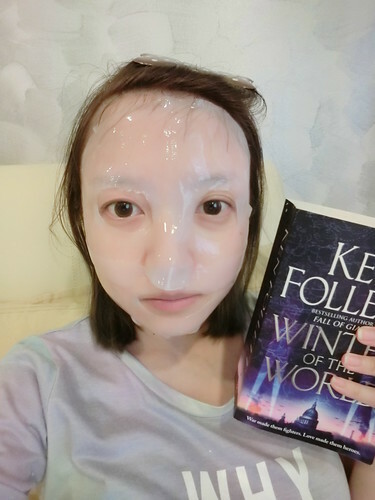 How many of you ladies use facial masks regularly put your hands up? I’m not too bad at my skincare routine. I NEVER go to bed without removing my makeup, and I always do the usual three steps – cleanse, tone, moisturize. 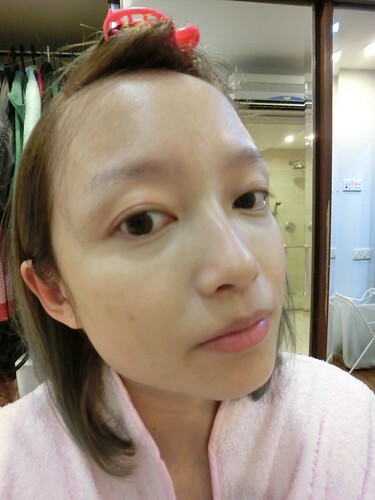 Also apply eye cream religiously because big eyes means big eye bags, big dark circles and big wrinkles wtf. I receive tonssss of masks from friends or from brands and I hardly do anything with them. I even usually reject when online shops ask me to review. They always seemed like such a hassle – put on and then cannot do anything for a while waiting for it to be done. And effect also not very obvious I might as well just slather more moisturizer on. 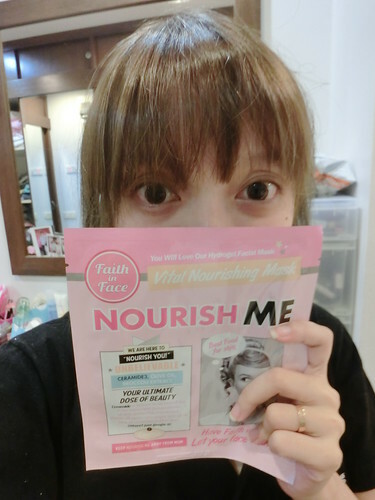 But then Faith in Face approached me… and I was a sucker for their packaging hahaha. WHO DARE SAY NOT CUTE AH. Faith in Face is a brand that originated in Korea. They are now available in Hong Kong, Taiwan and Thailand and from April onwards are now here at all major Watsons outlets in Malaysia as well. 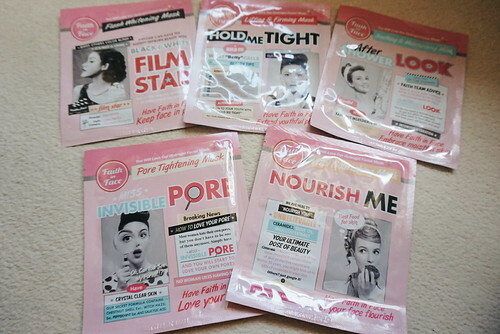 They’re launching with their range of hydrogel masks – the five pictured above. So here’s my review of Faith in Face. It starts off like any other mask – rip the outside packaging and pull the mask out. The mask itself is wrapped with sheer pieces of paper to protect it and keep the essence in. My first impression was that the mask is damn heavy. Much heavier than other masks I’ve tried before. Second impression is that not only is it heavy, it’s also very slippery. It was in fact a little tricky to pull out of the package. Why? Because the mask is not made of cotton or paper but a thick smooth bouncy, gel-like material. Later on I found out that this is a hydrogel mask. See the picture above? You can see it’s slightly shiny and gel-like. 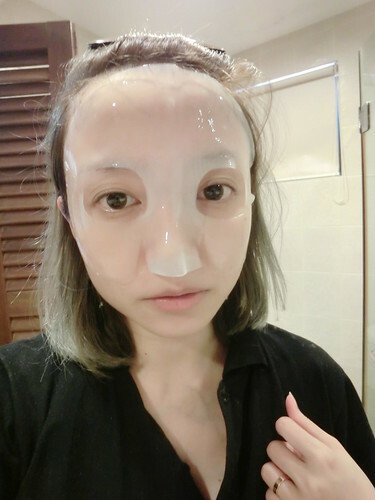 Because of the hydrogel material, the mask actually contains more ‘essence’ compared to other types of masks, and stay moist and hydrate the skin for longer. Over the course of a week I managed to test out the different masks. These are my favorites! HOLD ME TIGHT is a lifting and firming mask. It promises to let you hold on tight to your youth! Sounds like something this auntie needs yo. Carefully put on the mask… It actually comes in two pieces – one for the top of the face and another for the lower part. I’m guessing it’s so it will be a better fit generally. Then I chilled with my book for 30 minutes. After 30 minutes I removed the mask and noticed the mask is noticeably lighter! Either that or I buffed up in the last half hour wtf. 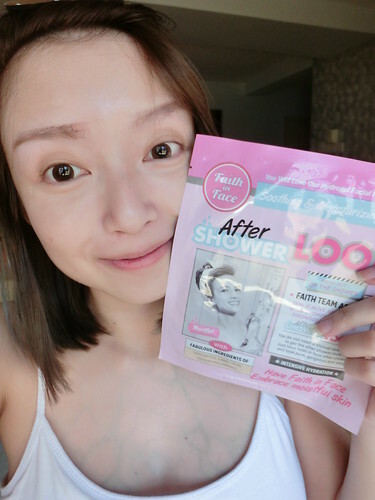 The nutrients from the mask had actually left it and absorbed into my skin which is why the mask was thinner and lighter after I was done! Massaged the remaining essence into my skin and then carried on with my usual makeup routine. Verdict: Skin felt moisturized but not much different from usual days. But then when I applied my sunblock and BB cream, I noticed my makeup glided on more smoothly than usual. HOLD ME TIGHT contains copper tripeptide that helps firm and liven the skin, and rooibos and red ginseng extract, a popular Korean ingredient which works to reduce stress and improve firmness to the skin. I was pretty excited to try this one out! 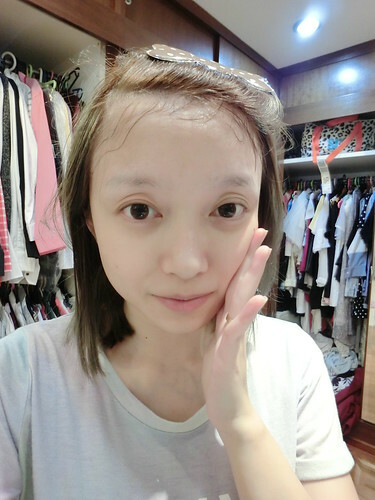 I like the feeling of my skin when I just get out of the shower – all damp and soft, very shiok and can bluff myself it feels like Fighter’s skin wtf. Here’s a close up of my skin after removal of the mask and massaging the essence in. Skin didn’t feel damp per se hahaha. But that might be because all nutrients were absorbed by the skin, because it felt… QQ. Don’t even know what the proper English word for it is… bouncy? Yes haha. Expectations of damp, soft skin not really reached, but my skin felt pleasantly bouncy and firmer to the touch. AFTER SHOWER LOOK comes with an intense hydration formula of Hyaluronic Acid, a moisturising super-agent, and natural Camellia Oil that locks in moisture. This would turn out to be my favorite! Did my usual mask application. Here I put on only the top part to give you a sense of what it looks like. Done! Love this mask! At first I didn’t notice anything but after I finished doing my makeup I noticed… my skin damn glowy can!? NOURISH ME combines Ceramide 3, which generates a protective layer over the skin and is one of the most important lipid compositions of the stratum corneum, with Broccoli Extract and Olive Oil. We have a winner! For me at least haha other people may have different results or opinions. depending on their skin type and conditions. Interested in trying out Faith in Face for yourself? I’m giving away a Faith in Face hydrogel facial mask goodie pack! There’re only limited Faith in Face Hydrogel Mask Goodie Sets to be redeemed – every 10th participant who emails will be the lucky winner! Learn more about Faith in Face on their Website and like them on Facebook !! Hydrogel masks are the best! Goodness Aud! You have such pale and delicate skin that it’s translucent! hey aud dont mean to be mean or whatever but are you really so pale that all your veins stand out in stark relief on your chest in the picture with the hold me tight mask?! sorry but i kenna stun tio by that… you’re like a vampire! !